Peel and cube all the potatoes and boil in a medium pot of salted water until tender. Drain and place in a medium bowl. Set aside the pot for later use. Whip together the potatoes, butter, cream cheese (or sour cream), seasoning, and as little milk as needed to form a thick but spreadable consistency. Heat the olive oil in a large pot and quickly sear the chicken pieces, seasoning with salt and pepper. Lightly brown just the outsides and remove to a bowl. Deglaze the pan with wine, stirring up the brown bits with a wooden spoon. Add the carrots, celery, mushrooms, and parsley, and simmer uncovered on low. While the vegetables are simmering, make the cream sauce. Melt two tablespoons of butter in the old potato pot and sweat the onions and shallots over very low heat. Whisk in the flour and continue stirring over low heat for at least five minutes. Add the garlic and stir another two minutes. When the flour is lightly golden, whisk in 1/2 c. of cream/milk and all of the broth. Continue whisking while the mixture thickens. Add the bay, rosemary, chives, salt, and pepper and cook 2 minutes. 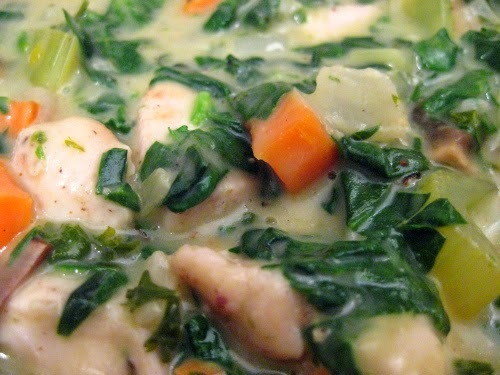 Stir the cream sauce into the veggie-wine mixture and add the chopped spinach. Cook three minutes more until the spinach releases its water. Add back the chicken and its juices. Season and add nutmeg and cayenne to taste. The mixture should be a thick stew-like consistency. Thin (only if needed) with a little more milk. Remove the bay leaves, if using. Pour the filling into a large buttered casserole dish. Let cool 5 min., then spread the mashed potatoes as evenly as possible over top without disturbing the filling. It’s OK if the topping doesn’t quite reach the edges. Spritz or drizzle the top with a little olive oil and sprinkle with paprika. Bake the casserole for 25 min @ 425F on a foil-lined baking sheet. If desired, broil the top for 3-4 minutes to lightly brown. Allow to cool at least 10 minutes before cutting and serving.